This book follows a familiar story – the nativity – told from the perspective of three animals: Ox, Donkey, and Sheep. As you read the book, your kids will discover that the true gift lies in giving and in doing KINDNESS for others. 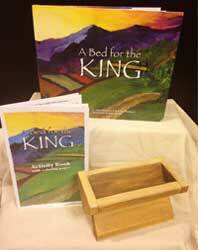 The goal of A Bed for the King is not to tell the nativity story – there are dozens of other books that do that. The goal is to teach kids how to build a foundation for a lifetime of doing KINDNESS. A Bed for the King tells a simple, familiar story, likeable characters, and concrete examples of what doing KINDNESS looks like. Click here to go get your copy from our publisher’s secure online store for check out.